Present-day ship newbuildings have to satisfy the following main requirements: high speed, low weight, easy draught. In most cases these design specifications cause vibration problems which result not only in the formation of cracks and material fatigue in the area of the afterbody but also cause failure and destruction of the technical and electronic facilities. Another major factor is the severe load on the crew from noise and vibrations - often up to the threshold of pain. More than 50% of the vibrations could be reduced by retrofitting the ships with a combination of WED and spoilers. In the specific case the first of two identically built 31,000 ton vessels (newbuilding 551) was equipped with duct and spoilers right from the outset, while newbuilding 552 was initially delivered without these attachments. During the sea trials of either vessel the nautical officers recorded travelling performance, speed and vibration behaviour. The analysis focussed, amongst others, on the vibration frequencies at various points of measurement: At the steering stand on the bridge the engineers took measurements without/with spoilers and equalizing duct of the longitudinal vibrations in the amount of 2.38 mm/s as compared to 0.93 mm/s, and vertical movements of 1.98 as compared to 1.39 mm/s. Similar differences can be seen distributed across the entire layout. 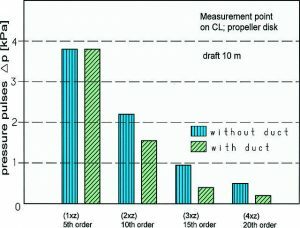 Due to the multitude of influential factors, even identical constructions will not, of course, bring about a vibration pattern that is coincident in every value and location, but it is highly probable that the improved values are primarily attributable to the more homogeneous water flow in the suction run of the propeller. The trials described above confirm: It is the superstructure above the stern, in particular, that suffers from the propeller-induced pressure pulses, and in the case of container vessels this is the deckhouse. The calls for proposals for newbuildings therefore frequently specify a vibration load of not more than 4 kilopascal (kPa) for the first-order vibrations. 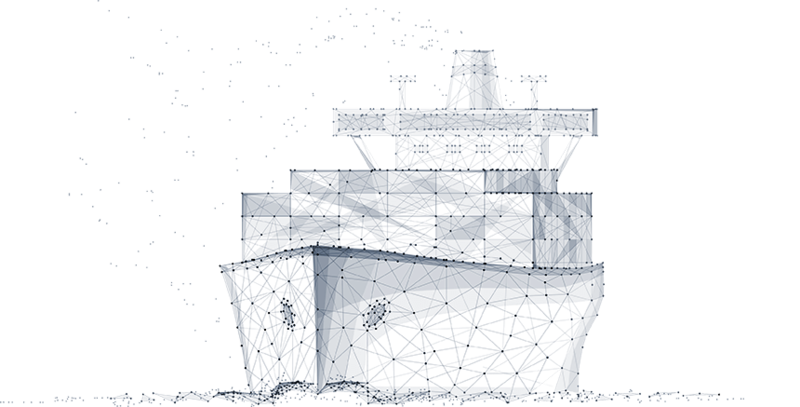 As stated above, shipbuilders endeavour to meet these restrictions to the maximum possible extent by way of a flow-optimized configuration of the stern section; this can, however, not always be achieved on the basis of the lines alone.